Itsuo Inouye/APToyota Motor Corp. President Akio Toyoda. TOKYO -- Toyota's quarterly profit more than doubled to 313.9 billion yen ($3.2 billion) as cost cuts and better sales worked with a weakening yen to add momentum to the automaker's comeback. Toyota Motor Corp. (TM), which last year reclaimed the title of world's top-selling automaker, said Wednesday it expects the strong results to continue in its new business year that ends March 2014. It projected a 1.37 trillion yen ($13.8 billion) profit, up from 962 billion yen for the year ended March 2013. The annual earnings result was better than the average forecast of 912 billion yen ($9.2 billion) in a FactSet survey of analysts and also outdid the company's own forecast for 860 billion yen ($8.7 billion) profit. Toyota reported a 121 billion yen profit for the January-March quarter of the previous year. A recent plunge in the yen, brought about by the economic and monetary policies of Prime Minister Shinzo Abe who took office late last year, is a boon for Japanese exporters such as Toyota because it boosts earnings from overseas. The U.S. dollar has gained about 20 percent against the yen and is now trading at nearly 100 yen. 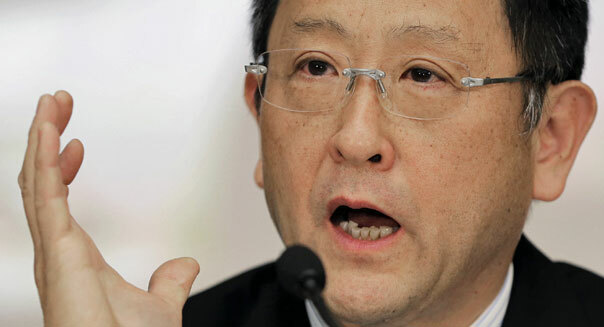 But Toyota President Akio Toyoda warned competition remains tough, while crediting "Abenomics" as helping automakers like "a wind that's blowing to push us forward." Toyota has undergone hard times in recent years, starting with the massive recall fiasco which hurt its image in the crucial U.S. market and came on the heels of the financial crisis that also slammed its business. Then the automaker's production was devastated by the March 2011 earthquake and tsunami in northeastern Japan. But the maker of the Prius hybrid and Camry sedan has been gradually recovering. "In the years since my succession as president in June 2009, we have faced many challenges. For Toyota, this was a period of perseverance but also a period of learning through extraordinary and invaluable experiences," Toyoda told reporters. He said he was far from confident Toyota was on a path to sustainable growth, and noted it was just "at the starting line." Analysts warn that Toyota faces intense competition from a powerful Hyundai of South Korea as well as more established U.S. automakers General Motors Co. (GM) and Ford Motor Co. (F) They are all fighting for a slice of the pie in growing markets such as Asia and Africa. Why is the battle between Coke and Pepsi -- two ultimately similar types of sugar water -- the most important struggle in the history of capitalism? Simply put, their rivalry transcends time, distance, and culture. It has divided restaurants, presidents, and nations. It has been waged in supermarkets, stadiums, and courtrooms. Its many foot soldiers include Santa Claus, Cindy Crawford, Michael Jackson, Max Headroom, Bill Gates, and Bill Cosby. In 1886 an Atlanta chemist introduced Coca-Cola, a tasty "potion for mental and physical disorders." Pepsi-Cola followed seven years later, though it would be decades (and two bankruptcies) before Coke acknowledged the company in the way it had other competitive threats: lawsuits. Pepsi-Cola had made hay during the Depression. Like Coke, the drink cost a nickel, but it came in a 12-ounce bottle nearly twice the size of Coke's dainty, wasp-waisted one. But by the 1950s, Pepsi was still a distant No. 2. It nabbed Alfred Steele, a former Coke adman, who arrived embittered and ambitious. His motto: "Beat Coke." Coca-Cola refused to call Pepsi by name -- the drink was "the Imitator," "the Enemy," or, generously, "the Competition" -- but it began tinkering with its business (and imitating Pepsi) to stay ahead. In 1979, for the first time in the rivalry's history, Pepsi overtook Coke's sales in supermarkets. It didn't last, and by 1996, Fortune declared that the cola wars had ended. Since then Pepsi, with its increasing focus on health and snacks, has as good as surrendered. America's favorite two soft drinks? Coke and Diet Coke. Ford, founded in 1903, and GM, which came along nine years later, have been warring for 101 years. The epitome of crosstown rivals -- their headquarters are just 11.5 miles apart -- they face off every day on dealer lots and in motor sports. Both maintain operations to scour the other's new products. In 2011, Ford marketing chief Jim Farley was quoted as having said, "I hate them and what they stand for." Meanwhile, GM chairman and CEO Dan Akerson recommended sprinkling holy water on ailing Ford luxury brand Lincoln. "It's over!" Hell hath no fury like a mentor scorned. In 1884 world-renowned inventor Thomas Edison welcomed a brilliant young Serbian engineer named Nikola Tesla into his New York office. Tesla had been working on direct current (DC) electricity in Edison's Paris division for a few years. Edison's DC apparatus reigned supreme at the time. But Tesla had conceived of a new method using alternating current (AC), which, unlike DC, could transmit significant amounts of power over long distances. According to Tesla, Edison dismissed his ideas as a waste of time, not to mention dangerous given the high voltage involved. Tesla designed several products for Edison, expecting to receive a promised $50,000 bonus for his efforts (about $1 million today). But when Tesla asked for his reward in the spring of 1885, Edison told him it had been a joke all along. Tesla quit. He struck out on his own, securing patents and catching the interest of Pittsburgh industrial titan George Westinghouse. Westinghouse had been quietly developing power stations using AC. Learning of Tesla's technology, he acquired his patents, putting the business might of the Westinghouse corporation behind the inventor. And the war came. When he heard that Westinghouse was moving into the electricity business, Edison ridiculed him. But it wasn't long before Edison was holding shocking public demonstrations to discredit AC power. To make his point, he electrocuted dogs, cows, horses, even an elephant. He then put his name behind an effort to use AC to power the first electric chair. The execution -- which took place in Auburn, N.Y., in August 1890, lasted eight minutes and required two attempts -- was a grisly affair. Westinghouse responded dryly, "They could have done it better with an axe." Ultimately Tesla's AC technology won the war, but the inventors' rivalry morphed into one of the greatest corporate battles in American history. A mega-merger of Edison General Electric and Thomson-Houston in 1892 created GE (GE, Fortune 500), which went toe-to-toe with Westinghouse. Long after Edison and Tesla died, their feud carried on until, in the 1980s, GE chose the right CEO (Jack Welch), while Westinghouse chose four successive wrong ones. By the late 1990s, GE was the most valuable company on earth. The original Westinghouse was no more; the current company with that name is less than one-tenth GE's size. MCI didn't seem like a giant killer at first. It was a startup that sold long-distance services via microwave towers to truck drivers. But chairman William McGowan, a hard-living son of a railroad engineer, led his company to do just that. Rather than duck Ma Bell's assaults (predatory pricing), MCI took her head on, filing a case that would lead to the monopoly's breakup -- and an antitrust playbook that others would use against Microsoft decades later. In 1980 a jury awarded MCI $1.8 billion. Two years later the government ruled Ma Bell a monopoly no more. David had slain Goliath. Blame it on the shoes. The battle between Nike and Reebok lasted over three decades and created celebrity athlete culture as we know it today. Initially the two couldn't have been more different: Phil Knight, a former University of Oregon track star and a Stanford MBA, tossed his accounting career and formed a company to import running shoes to the U.S. He named it Nike after the Greek goddess of victory. Paul Fireman dropped out of Boston University to take over his family's sporting-goods business. He acquired the North American rights to British-made sneakers. Reebok, a line of white-leather women's aerobic shoes named after an antelope, took off as jogging became a national craze. Fireman bought out the parent company in 1984 and took Reebok public the following year. Nike, which had risen to prominence by aggressively courting male customers and fostering a jock-laden management culture, missed the market for women's sneakers. Reebok overtook Nike in 1987 as the latter struggled to catch up. Reebok responded by signing Shaquille O'Neal, who once showed up to a meeting with Nike wearing a jacket emblazoned with a huge Reebok logo -- much to the dismay of Nike executives. At the 1992 Olympics, Jordan controversially draped a U.S. flag to hide the logo on the Reebok-sponsored tracksuits worn by the U.S.'s winning Dream Team. The move delighted Knight, who baited Reebok further by contributing $25,000 to figure skater Tonya Harding's defense fund after she was accused of orchestrating a vicious attack on Nancy Kerrigan, a Reebok athlete. Nike continued to snap up the most popular athletes, including Andre Agassi, Pete Sampras, and later Tiger Woods, making Reebok seem lame by comparison. In 2005, Adidas bought Reebok, but the new, combined company is still a distant second to the Nike juggernaut. Bill Gates and Steve jobs were as different as night and day, yet they had much in common. This probably explains the bitterness of their rivalry. The fruits of their enmity? The creation of the personal computer. First, the differences: Gates was an upper-middle-class kid who went to Harvard. Jobs grew up in a family of modest means and didn't attend many classes at Reed College. Deeply technical, Gates wrote the code for Microsoft's early products himself. A born marketer with enough technical chops to be persuasive, Jobs relied on collaborator Steve Wozniak to create the first Apple computer. Gates was the poster child for geeks everywhere. Jobs, meanwhile, was suave from the start. Gates understood scale and leverage; Jobs grasped style and message. (The more charismatic figure, Jobs, will have been played on film by both Noah Wiley and Ashton Kutcher.) Gates and Jobs became the opposing poles of the frantically growing computing revolution. Above all else, though, these rivals understood business. Neither had formal training in the black arts of balance sheets and income statements. Indeed, neither had graduated from college. Yet both were preternaturally shrewd about making a buck -- and how to stick it to the competition. The two were known to trade not-so-subtle barbs. Jobs diagnosed Microsoft's essential problem as a lack of taste. Meanwhile, Gates summed up one of Jobs' greatest achievements, the iPad, by saying simply, "It's okay." Born seven months apart (Jobs was older), they were friendly in the years before Jobs died. Having fought each other for so long, they knew better than anyone what the other had accomplished. The Italian Maritime republics invented many now familiar features of the business world. It started with tax breaks. Venice and Genoa sat out the feudal era because they didn't have the land needed to produce surpluses -- Venice is in a lagoon, and Genoa is hemmed in by mountains. But they were in the sweet spot for trade. By lending their navies to rulers fending off invaders, they won special privileges to trade without paying tariffs. Around the end of the 12th century, these conditions created an astonishing boom that fueled their feud. To raise the money to assemble ships, crews, and cargo, traders came up with the idea of selling shares in their operations. To spread the risk they invented marine insurance. Eventually, to maintain clear records, there arose a sublime invention: double-entry bookkeeping. Goethe may have been into the schnapps when he (reputedly) said that "double-entry bookkeeping is one of the most beautiful discoveries of the human spirit," but you can see what he was driving at. Without the concepts of credito and debito and the balance sheet, modern capitalism wouldn't be possible. Hewlett-Packards' victory over IBM has not been particularly sweet. In 2006 it surpassed IBM in revenues, a lead it has maintained. But revenues are not the only measure of success. Since the earliest days of IT, they have been polar opposites: HP seeded the engineering-heavy ethos of contemporary Silicon Valley. IBM's iconic Thomas Watson was more salesman than scientist. HP (HPQ, Fortune 500) has had more CEOs in a decade than IBM (IBM, Fortune 500) has had since the end of the Watson family reign. IBM draws from five-year plans, while HP is fond of aggressive moves. It's about more than airplanes. The $160 billion aviation industry is pivotal to national economies and thousands of jobs, not to mention civic pride. Boeing once dominated, but Airbus, a subsidiary of Franco-German defense giant EADS, edged out a lead in 2003. Political tensions have run hot since. Trade officials on both continents are fond of scathing op-eds and public statements alleging malfeasance. Both sides have a point. A 2011 leak revealed a personal letter from President George W. Bush to Saudi Arabia's King Abdullah urging the purchase of Boeing jets. And Airbus has received billions in subsidies. As Boeing deals with 787 Dreamliner delays, Airbus has taken to depicting its planes with a Pinocchio nose. Ouch. Abraham Lincoln kicked off the race in 1862. The Union Pacific Railroad started building westward from Omaha while the Central Pacific Railroad built eastward from Sacramento. They would meet in Utah, each receiving land and U.S. bonds per mile of track built. In 1869 trains from both companies touched noses, and then one passed the other to continue across the country. The race ended, their feud dissolved. McDonald's Corp (MCD, Fortune 500). founder Ray Kroc summed up the intensity of the fast food business best when he said of his competitors, "If they were drowning to death, I'd put the hose in their mouth." In the quick-serve restaurant industry, no two brands have waged war over customer loyalty as publicly as McDonald's and Burger King. The rivalry dates back to the mid-19th century as both companies emerged on the national scene, battling for territory and franchisees. The burger business is all about share of stomach. There are only so many ways you can innovate when it comes to a hamburger, so copying competitors' ideas is standard practice. Take the Big Mac, which was launched in 1968 as McDonald's answer to the Whopper. Burger King introduced the Whopper in 1957 when, after realizing it couldn't compete with McDonald's 15 cent hamburger, it decided the solution was to sell a bigger burger for 37 cents. Burger King declared all-out war in 1982 by launching an advertising campaign that claimed customers preferred the Whopper to McDonald's and Wendy's. Both chains countered by suing for false and misleading advertising. In 1997, the Home of the Whopper again took on the Golden Arches -- this time its fries with the tagline "the taste that beats McDonald's." McDonald's struck back with its own advertising campaign. The heated rivalry cooled as Burger King suffered a revolving door of CEOs and owners, which helped McDonald's gain more ground. In 2011, for the first time ever, Wendy's surpassed Burger King to become the No. 2 burger chain by sales. "In America, McDonald's has won," says Andrew Smith, who teaches food history at the New School. But don't count Burger King out just yet: In February the chain got into the latest fast food battle, Coffee Wars, when it announced a line of coffee-based drinks like lattes through a partnership with Starbucks' (SBUX, Fortune 500) Seattle's Best Coffee brand.